This visualization describes temperature changes relative to years 2015-2024 from unabated climate change (RCP8.5) and stratospheric sulfate aerosol geoengineering (using feedback) simulated by a state-of-the-art coupled earth system model. Geoengineering, often using stratospheric sulfate aerosols, is discussed as a potential means of deliberately offsetting some of the effects of climate change, such as rising temperatures. 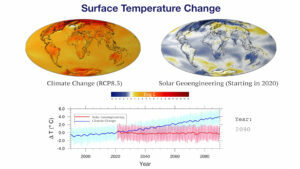 Many previous simulations have looked at specific scenarios of geoengineering and analyzed the resulting climate effects. Here we turn the question around by choosing specific climate objectives and evaluating whether and how one can meet those objectives in the presence of uncertainty. In particular, we show the results of meeting three simultaneous surface temperature objectives (global mean, inter-hemispheric, and equator-to-pole gradient). 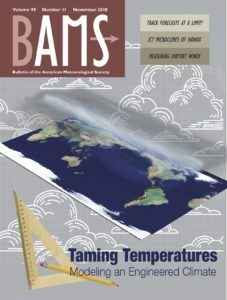 The model uses feedback on the “observed” model state and adjusts the amount of sulfate aerosol injection in the stratosphere at each of four latitudes every year, depending on whether more or less is needed to keep the climate at 2020 conditions with increasing greenhouse gas emissions. While warming in the RCP8.5 simulation (a scenario with no climate policy) continues unabated, global patterns of warming are suppressed in the geoengineering (feedback) simulation. This simulation was produced with CESM1(WACCM), a version of the Community Earth System Model version 1 (CESM1) with the Whole Atmosphere Community Climate Model (WACCM) as its atmospheric component. This state-of-the-art atmosphere-ocean earth system model, developed by the National Center for Atmospheric Research (NCAR), contains significant advances in representations of chemistry, stratospheric dynamics, and aerosol microphysics. These representations, including an internally generated quasi-biennial oscillation, are crucial for capturing the important uncertainties and nonlinearities inherent in stratospheric sulfate aerosol geoengineering. This research was made possible with an NCAR Strategic Capabilities 10-million core-hour allocation on Yellowstone supercomputing platform, a 1.5 petaflops high-performance IBM iDataPlex cluster at the NCAR-Wyoming Supercomputer Center in Cheyenne, Wyoming. CISL/NCAR facilitated visualization, and storage resources. Paper information: Kravitz, B., D. G. MacMartin, M. J. Mills, J. H. Richter, S. Tilmes, J.-F. Lamarque, J. J. Tribbia, and F. Vitt, 2017: “First simulations of designing stratospheric sulfate aerosol geoengineering to meet multiple simultaneous climate objectives”, J. Geophys. Res.